Scott Sehman, pictured in a police mugshot and outside Newcastle Crown Court, and the injuries caused to the victim. A man has been jailed after a care worker's throat and head were savaged by a dog that had to be shot dead by the police. The woman suffered "life threatening injuries", needed emergency surgery and spent more than six weeks in hospital when the Japanese Akita attacked her at a house in South Shields, last summer. Scott Sehman at Newcastle Crown Court. The incident sparked a dramatic police operation, with armed officers forced to shoot the dog dead. The victim's windpipe was damaged and she suffered "multiple wounds", including a black eye and an injury to her nose when the animal, that had been tethered to a bed, pounced. She was left unable to speak or eat properly and cannot return to her job as a carer. Some of the woman's injuries. At Newcastle Crown Court Scott Sehman, whose mother owned the dog but had told him to keep himself and any guests at her home away from it, has been jailed over the attack. 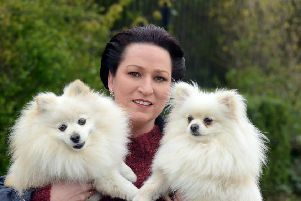 The 32-year-old, of no fixed address, had admitted being in control of the dog when it caused the near-fatal injuries. Prosecutor Stuart Graham told the court that the victim had been out drinking in South Shields last August, bumped into Sehman at the marketplace and accompanied him back to his mother's house, at Julian Street in the town, where he was staying temporarily. Mr Graham said: "Sadly, the last thing she can remember is waking up in the address, with a huge dog on her neck. The property in Julian Street after the incident. "She was coughing up blood. She doesn't remember how she got into the house, where the dog was or how the dog has come to bite her. “All she can recall is being unable to breathe and remembers being in the back of the ambulance. "She suffered, at the time, life threatening injuries." Mr Graham said the destruction of the dog at the scene was "instantaneous". The woman still needs to eat her food mashed up. He added: "From CCTV footage you can hear gunshots. Police who attended shot the dog there and then, in the house, where it was tethered. "The dog is no longer." Mr Graham said the attack on the woman has "affected her whole life" and even the sound of a dog now frightens her. She still requires her food to be mashed up so she can eat it. Judge Simon Batiste sentenced Sehman to 16 months behind bars and banned him from keeping animals for ten years. The judge said: "She was attacked on the throat, back of the neck and other places around her face. "She was rushed to hospital for emergency surgery to solve some of the problems with her throat and windpipe. She was in hospital for six to seven weeks. "Her victim statement makes it clear the attack has caused life changing injuries to her." The judge said Sehman had "failed to respond to warnings" from his mother to keep people away from the animal. Jane Foley, defending, said the dog had previously been owned by an abusive alcoholic but was rehomed with Sehman's mother. Miss Foley said the animal "had a sensitivity" towards drunk people as a result of its past abuse and so Mrs Sehman had told her son to keep himself and others away from it. The court heard the animal had been kept tethered to a bed in Mrs Sehman's room. Miss Foley added: "The dog was in his mother's bedroom. Having attended the property he went to fetch a drink for himself and he complainant. "She, however, ventured into the mother's bedroom and fell upon the bed. It was at that point that the dog reacted in the way it did and attacked her." Miss Foley said Sehman had tried to intervene during the attack and alerted the emergency services. Miss Foley added: "He didn't think for a second that the dog was going to savage either himself or her."